Three months ago, to much fanfare, Ireland had its first “fire sale” auction, courtesy of Allsop and Space. It was generally regarded as a big success and there was interest straight away in when the next ones would be. The second fire-sale auction took place earlier this month, to a good bit less fanfare but with about the same high level of success as the first one. 77 of the 87 lots were sold at the auction, with a further five likely to have sold on the day given the small gap between the highest bid and the reserve. As per usual, public servant extraordinaire NAMAWineLake has a wealth of information about the auction, including links to the brochure and a full table of the reserves and prices achieved. Much of the focus in the immediate aftermath of the first auction was either on how many people turned up or how much above the reserves the properties sold for. My own analysis highlighted what I thought were two more important statistics: the fall from the peak, and the relationship between rents and house prices. In the April auction, prices were typically 65% below the peak (and about one third below prevailing asking prices in late 2010). More importantly (to an economist anyway), the annual rental income typically formed about 9% of the purchase price paid. Either of these statistics could be used by prospective first-time buyers to inform their decisions. I felt at the time, though – and indeed one or two people made the same point in the comments on that post – that just as one swallow does not a summer make, so one fire-sale auction can’t on its own reveal the new level of house prices that will prevail. With 75 to 100 lots at these one-day auctions, it will take perhaps ten or twelve of these auctions to have a sample of properties large enough to be more definitive about what price will shift a property, especially if we want to say something about differences across regions. In particular, it will be interesting to see what happens to prices across successive auctions. If the price level is broadly the same across auctions, that would suggest a floor is out there and each auction is helping to reveal it. If prices fall from auction to auction, that would suggest investors’ ideas about the “fundamental value” are worsening (perhaps if rents were still falling). Conversely, if prices rise with successive auctions, that could suggest conditions – especially, one would think, in the moribund mortgage market – are improving. After a week’s holidays, I’ve taken down my Irish property market, dusted it down and plugged in the details (such as area, house type, bedroom and bathroom number) for each of the properties and calculated a ballpark asking price for each property, both for the peak (mid-2007) and currently (mid-2011). Excluding sites, commercial properties and a few other anomalies, there were 57 residential properties for which prices could be calculated. For me, two things stick out from the analysis: the key stats look unchanged, while it seems a Dublin/rest-of-country paradox is emerging. The typical residential property in the second fire-sale sold for €120,000, which is 70% below the estimated peak price of €400,000. Perhaps more surprisingly, this is a pretty substantial €100,000 below what the likely current asking price would be if these were “normally listed” properties. For comparison, the median price for the first auction was about 67% below the estimated peak (and about 35% below current asking prices then). So, given that these are small sample sizes (about 60 properties in each), it looks like broadly the same price level prevailed across both auctions. While asking prices fell by 5% during the second quarter of 2011, it’s unclear that auction closing prices budged by much. The other key stat that prospective first-time buyers can use from these auctions is the yield, the relationship between annual rental income and the price. As long-standing readers of this blog may be sick of hearing by this stage, this should look like an attractive savings rate: NAMA used 6% as its benchmark, compared to just 3% at the height of the boom. The first fire-sale auction had a typical yield of closer to 9%. As it happens, this second auction had more vacant possessions and so less information on rents to work with, but the median rent for the residential properties that do have tenants was 8%, very similar to the first auction. If the monthly rent is €1,000 (think of a 3-bed in West or North Dublin, or a large family home in Galway or Cork cities), an 8% yield would mean a price of €150,000 (i.e. the annual rent of €12,000 divided by 0.08). If monthly rent is €1,500, as it would be for four-beds in many parts of Dublin, the buyers at this auction are advising you to pay €225,000. Lastly, if the rent is €750, as it is for the average four-bed home outside the cities and commuter counties, an 8% yield would suggest a price of €112,500. I have the feeling that some sellers with properties listed at the moment would not even laugh at offers of this kind, they would genuinely be offended. However, that is what both the fire-sale auctions are telling us. Are prices in Dublin falling by more or less? One of the “stylised facts” of the property market bust so far is that Dublin has fallen by more than the rest of the country, from the 2007 peaks. 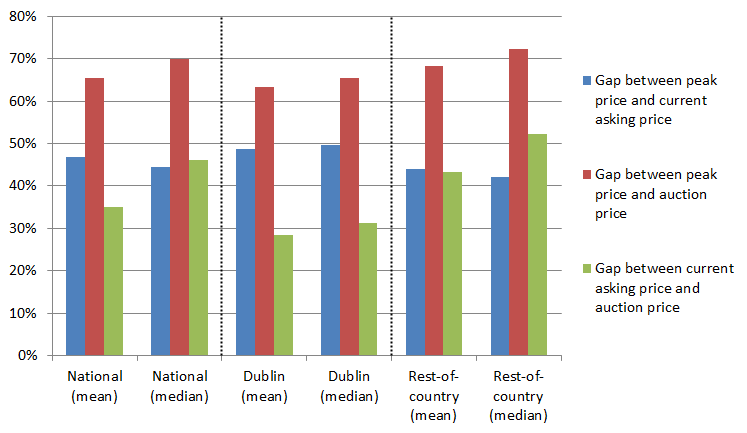 In June 2011, asking prices in Dublin were just over 50% below their 2007 peak, on average. At the same time, prices in Munster and Connacht were about 40% below their peak. Ever the two-handed economist, there are two ways of reading this. The first is that this is not at all surprising; Dublin prices rose by more and thus have more to fall. Attractive though this is, I’m not entirely convinced that this “gravity logic” – what goes up must come down – captures the full dynamic of a market, particularly given that markets are about supply and demand and supply has been extended hugely outside Dublin through boom-time over-construction. The second interpretation is current asking prices reflect “market thickness”, not what is actually happening closing prices – indeed prices could fall outside Dublin by more because over-construction was relatively light in Dublin. This line of reasoning is as follows: the only reason that Dublin asking prices have fallen by more is because sellers in Dublin are being more realistic (relative to the true selling price), and the reason they are being more realistic is because sellers there have better information as to what kind of price will actually find a buyer than a seller in a remote rural region. Thus falls in asking prices reflect to some extent the sheer size of the market. For the “market thickness” interpretation to hold, the gap between the auction prices and what I’ve estimated as the current asking prices would need to be larger outside Dublin than in Dublin. Looking at the results from the first two auctions, this is exactly the picture that is emerging. Current asking prices for the Dublin properties at auction are about 50% below the peak, compared to 42% for the rest-of-country (ROC): by asking prices, Dublin looks to have been harder hit. But Dublin prices achieved in the auction are between 60% and 65% below the peak, compared to 70% for ROC: by auction prices, Dublin looks to have escaped the worst of the falls. An overview of these figures are shown in the graph below, where – due to small samples – I’ve included both median and mean figures. Put another way, if auction prices tell us something about the true price level in the wider market, Dublin sellers typically get about a quarter less than what they ask for, while sellers elsewhere typically face a discount from their asking price of almost a half. It certainly seems the case that “market thickness” – i.e. information – matters. This is perhaps the most compelling argument I can make right now for the establishment of the house price database that the both this government and the last government have promised. If buyers and sellers could access information on transactions in real-time, this would minimise the dead-weight loss that we face in Ireland with a moribund property market. (Perhaps I should write in this case dead-wait loss, as the market is currently in a state of “sit and see what happens”.) If not, we’ll just have to keep on using asking prices and fire-sale auctions of a few dozen properties to understand what is happening house prices! As usual, shrewd and practical analysis. But is anyone listening? In the US we have easy online data for local house prices. If the government won’t do it, why don’t realtors? Thanks for the comments. As to why estate agents don’t do this themselves, I think it’s worth contrasting U.S. realtors with their counterparts in Austria. Whereas the former sees an opportunity in using their information to make reports, the latter sees a threat in even putting up “for sale” signs on homes, as that would undermine their business model: being gatekeepers of information. Irish estate agents are in the middle – Sherry Fitzgerald do publish their own house price index for example, but overall estate agents until recently didn’t their business as systemic. I have found (only in an anecdotal way)the same thing in restaurants as you found in housing. Restaurants in the Dublin area have cut their prices and are offering more early birds and special value meals than outside Dublin. The prices have not come down to the same extent outside Dublin. I think this type of market thickness is in evidence in eating out as well as in house prices. I think it is a large shame. Outside hotels and restaurants being run by NAMA tourists visiting the west of Ireland are still paying to much for eating out due to this market thickness. Perhaps Bord Failte should get involved here to save rural restaurants from their own lack of information and make them aware if their prices are out of line. There is of course another theory that a rural mind set (perhaps this explains why the rural sham version of the allsops auction was a disaster) could be part of the reason for the market thickness rather than it being just down to lack of information? I think such analysis is insightful as to a large extent and in other information gathering the government is derelict in its duty. The points are clickable and give the property type, reserve and price achieved. Thanks for the analysis Ronan – a colleague in london has just alerted me to this website. One contentious point I’ve always had with valuations is the discount rate. I don’t believe you should be using the annual rental yield as the appropriate rate. I believe that the income assumption should be calculated to factor in the risk (less marketable house should receive more defensive number) and the discount rate is the rate of return that the capital owner could reasonably expect from allocating his capital. The discount rate is different for every investor and is the reason why valuations differ. This could possible explain different valuations in Dublin vs ROC – namely Dublin capitalists have a greater understanding (or merely a more optimistic one) of what return they can expect from investing their capital. This would then lead to lower valuations. Thanks for the comments and links. @Killian – you’re right in the sense that an investor will consider a broader range of factors than just the cost of borrowing. However, this is usually done within the yield framework: so, (medium-term) cost of borrowing may be 5-6%, to which an investor will add factors such as a risk premium for the general asset class, a premium for the specific property within its class, costs of depreciation and maintenance, uncertainty about rental income, etc. For owner occupiers, there may be different factors again, in particular hedging against rent uncertainty, which should push their yield down, relative to landlords (as it happens, I’m actually working on a model at the moment to understand how the two differ). PS. Some wags over on thepropertypin.com have pointed out that I’m using “market thickness” where I could have just used “liquidity”… I was trying to keep away from industry jargon, but point taken! Given what we know about the influence of bank lending in relation to the property market, which in my view ultimately means banks actually price property not developers, not estate agents and certainly not consumers. We can all see the effect this is having on the market i.e. with the banks effectively absent there is no real property market. This leaves me curious as to why property commentators such as yourself constantly clamor for a comprehensive market database of house prices. I simply don’t get the logic here. If banks are active in the market in a normal environment one doesn’t or shouldn’t have any more comfort in the price of the property in question. Why? Because, it’s largely an artificial price in any event. In 98% of residential property transactions a lending bank is required to complete the transaction so a database will likely only reflect the banks attitude to property at the time or their ability to lend or as it is today their ability to comply with Regulatory rules good bad or indifferent. In actual fact any pricing database will give one very little real information because leverage driven asset prices are largely controlled by the providers of the leverage not the users. As indicated banks price property not consumers. on the health and risk taking capacity of the banks and their balance sheets. The long term benefit of this being, well I’m not altogether sure what if any the benefit really is. It certainly hasn’t been of great assistance to many property consumers in the US where many States provide very detailed price databases – it didn’t prevent a massive pricing bubble developing there and I question if Ireland would have been any different – my initial reaction is definitely not. To me what we actually require, and you make reference to this in your note above, is a database road by road town land by town land of rental prices, or accurate proxies where available. Now such a database would have real value. Why? Because it’s the cash cost of the asset in question not a leverage cost. Cash is normally king and in the property market its informational value is far superior to leverage pricing. Such a rental database would likely bring us closer to pricing housing off long term rental yields and as result ensure supply demand dynamics actually matter in pricing, as they should. As opposed to what we have had for the last decade (last year aside) where banks lent money with little or no reference to the underlying rental yield and as a result mispriced the asset class for a decade or more. The resulting consequences are all to painful to see. So I’d say a call for very detailed rental price database is where we need to concentrate our efforts going forward. The banks lending models have proven to have been an unmitigated disaster and a mispriced asset class has resulted – which is slowly reverting to long run averages. Why we consider it important to rehash the error in a formal sense all over again to me seems a waste of time and energy. As indicated above by one of your contributors the discount rate used to price property from a rental differs from buyer to buyer. This is true but what we do know is that the underlying rent is a better reflection of the supply demand dynamic and discount rates have on average reverted to 7% net in Ireland over the years records have been kept which is since the early 1970s. So both pricing inputs to my mind are more secure than highly questionable times salary model nonsense which negates a pure pricing database usefullness. Is a rental yield of 9% sustainable? Honestly? The only reason such rates have managed to hang on by their fingertips is the huge subsidy pushed to the private rented sector from SWA rent subsidies. From Joan Burton’s speech this morning it would seem that this rich gift to the landlords of Ireland is going to be a hot target for cutbacks. Secondly, most landlords collect rent as a secondary income. From figures above and from the income requirements required to sustain second home borrowing (even at the peak of the boom) most landlords would pay a marginal rate of tax at close to 50%. This surely cuts the real rental yield? I would guess that one of the reasons that prices have remained higher outside of Dublin is that a) the sellers simply cannot afford to cut prices because of equity shortfalls b) SWA rent subsidies are more readily accepted as often there is simply no real market rental demand outside of those on welfare, and c) there are far fewer properties, so harder to get a strong statistical picture? Thats just a wild guess, given that there is no official register of sale prices, even now. I have no doubt that the rent allowances will be severely culled but the effects of that on yields are not linear as you are perhaps suggesting. Its probably likely that yields in the environment that you suggest will likely fall but thats assuming its all numerator driven. What’s actually likely to happen is that both numerator and denominator will take a downward move holding yields above long run averages until the supply demand equation gets back to somewhere approaching normalised levels. At that point rents and house prices will be at fair value and I would expect average net yields at that time to be +/- 1% of long run averages at 7%. Comparing prices of the properties that sold against the same or similar properties from 2007 on daft/myhome.